My ordinary moment this week was my dad arriving home from his holiday in South Africa. 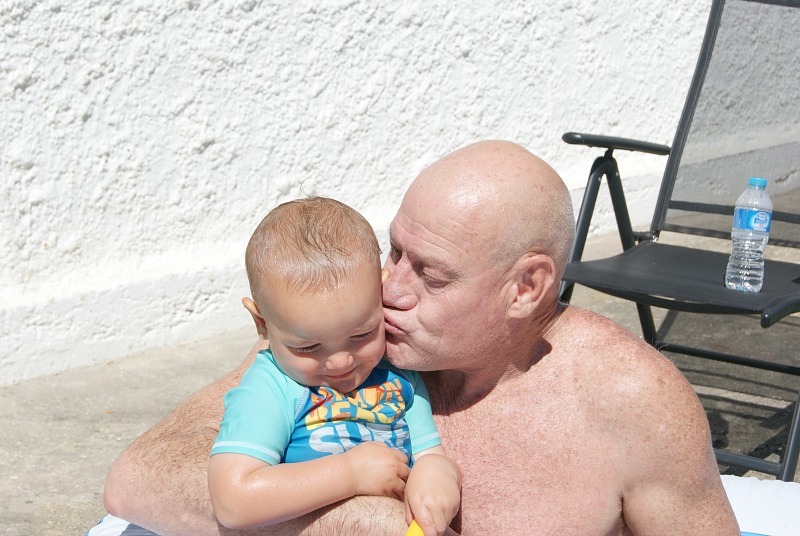 He was away for a few weeks and both the children missed their grandad lots. The day he arrived back he spent at home with us. 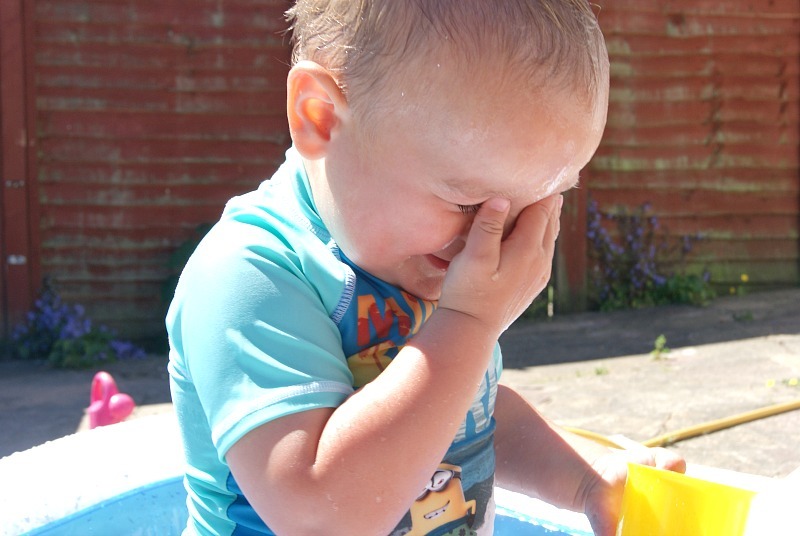 It was a beautiful day with lots of sunshine, so I put the paddling pool up for the children. Sophia was at preschool for the day so it was just Archie and my dad until 2pm, my sister’s popped in too. 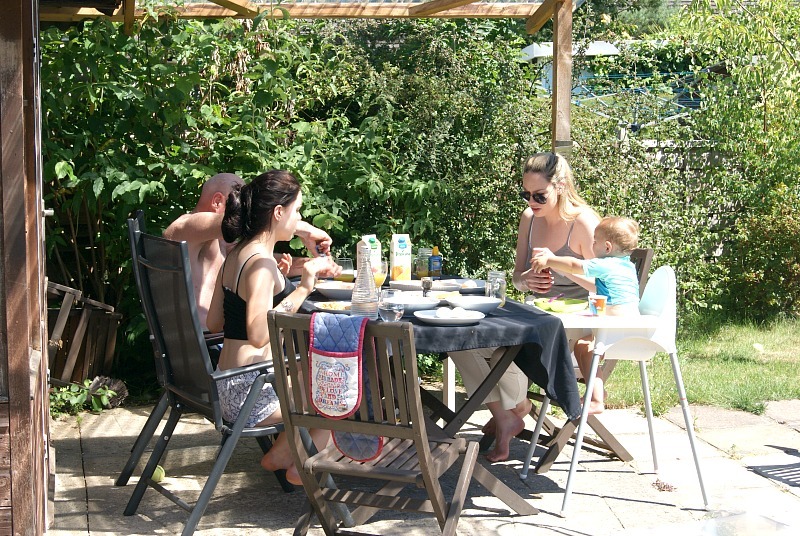 We had a lovely late breakfast together and this was so lovely because we hadn’t done this for a while as dad has been away. 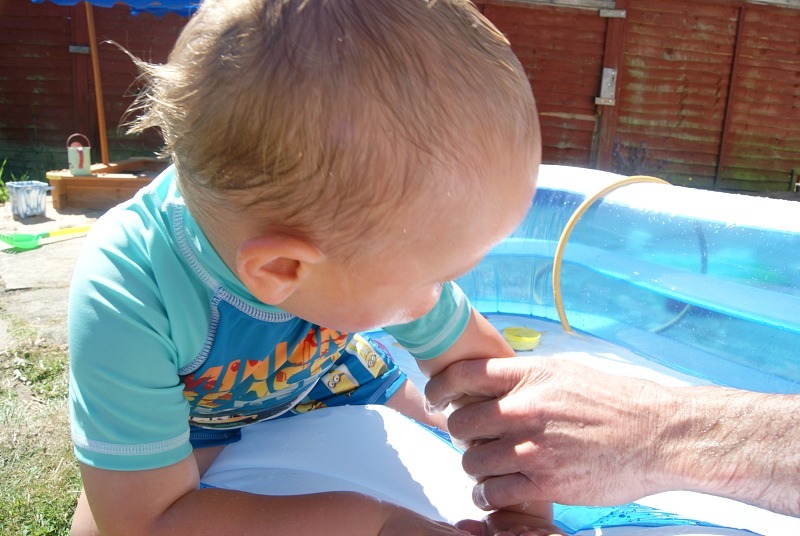 Once we had cleared up our brunch Archie called his grandad over to the pool and I captured some lovely pictures of the two of them having some time together. 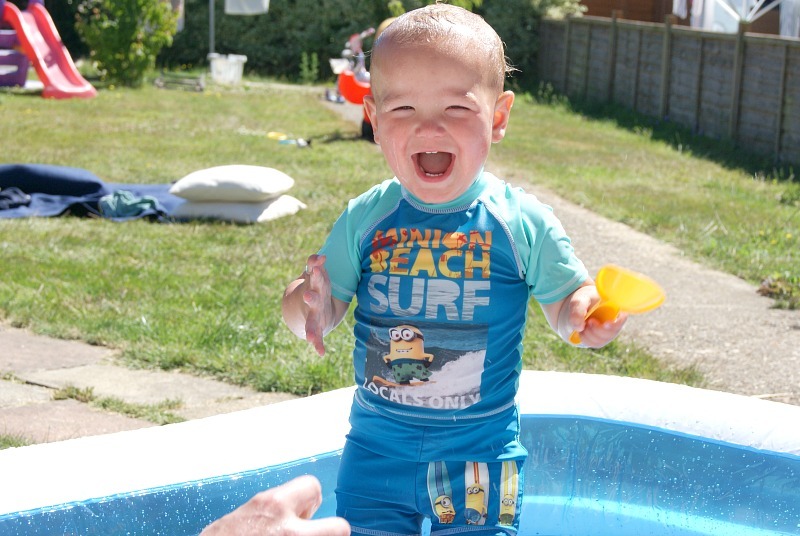 Archie absolutely loves the water, and the joy in his face as he splashed and played was so beautiful to see. 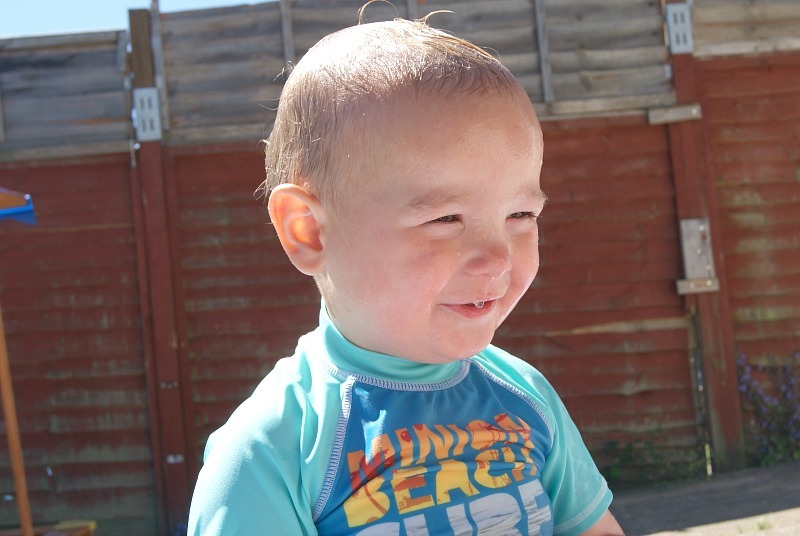 He really enjoyed it, being with grandad, being in the sun, and the water it was all so ordinary and it was all so special. 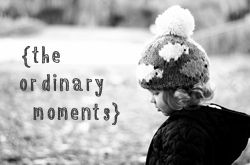 It is the really everyday moments that make you stop and appreciate how lucky you are to have what you have and to experience the moments you so individually experience. 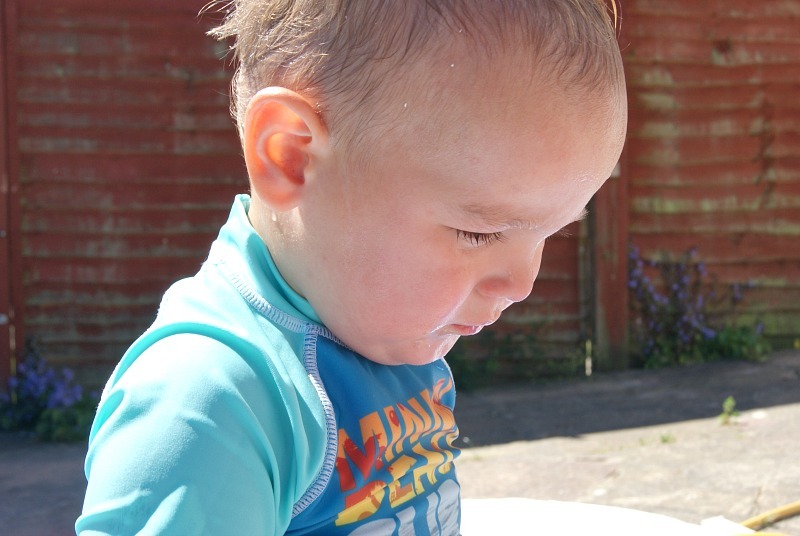 From my eye view it was beautiful to see the joyful smile on my sons face and his dimples, his little baby hands clapping and splashing the water, watching as he had to close his eyes from his own splashing, I saw him in front of me, he was happy and his bellowing laughter and little giggles told me this. The way he jumped up and stood tall in the water taking deep breaths, while he laughed and enjoyed himself. Children have a magical way of perceiving the world. They take every activity as a blessing a time to be joyful and a time to be happy, now. I learn a lot from my children and I am thankful for that. Everyday in the ordinary. Don’t you think children have a beautiful way of looking at life? He has such a beautiful smile. 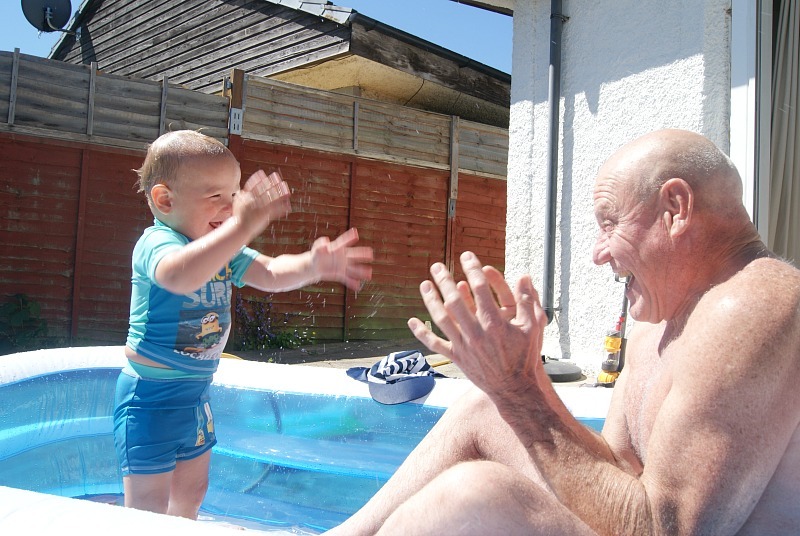 Looks like he’s having a great time in the pool with his grandad! 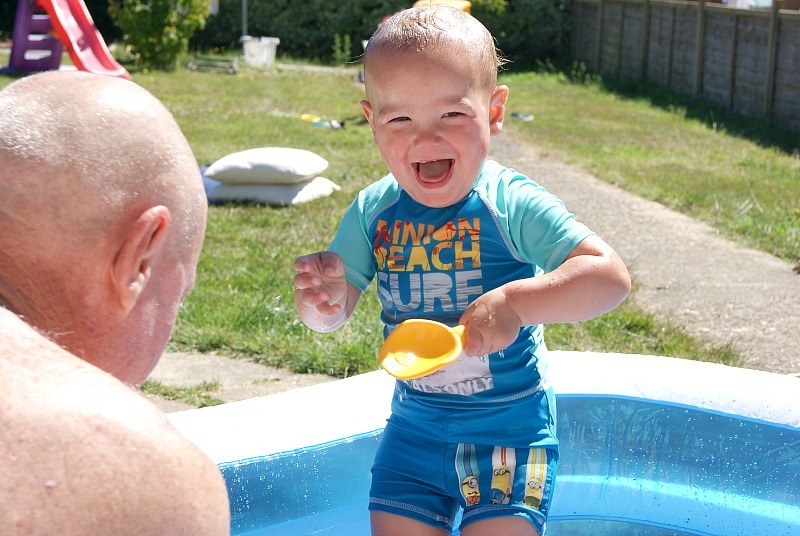 Oh those smiles would melt the stoniest heart – Archie looks like he is having just the best time in the world – what a wonderful way to celebrate your Dad being back, and I suspect after flying for that long he found a paddling pool the perfect thing!